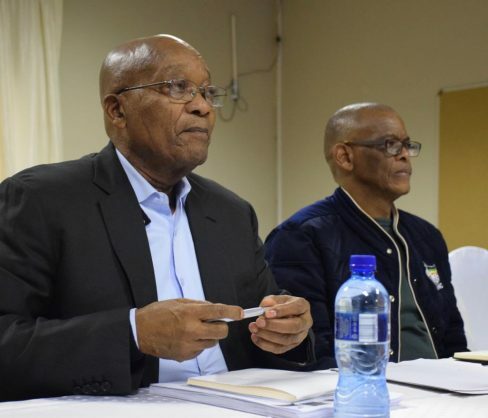 African National Congress (ANC) secretary-general Ace Magashule told delegates at the party’s KwaZulu-Natal provincial conference that former president Jacob Zuma ranked among the greatest leaders of the party. Magashule was delivering the opening address at the governing party’s long-awaited conference being held at the Durban University of Technology (DUT) sports centre. “The ANC of today is still the ANC of yesterday, the character of the movement remains intact,” said Magashule. Great leaders of the movement included Pixley Ka Seme, John Dube, Albert Luthuli, Josiah Gumede and “president Jacob Zuma”, he said. During his tenure, Zuma built on the legacy of the movement and “took the bold decision to achieve radical economic transformation”, said Magashule, before adding that Zuma would probably attend the conference. “President Zuma has led the movement to achieve free education for all students from the working class and poor,” he said. The conference is set to run from Thursday to Saturday and will see new provincial leadership being elected. Senior ANC leaders including Dr Nkosazana Dlamini-Zuma, Dr Zweli Mkhize, Jackson Mthembu and Zizi Kodwa attended on Thursday night. As per the programme, party and state president Cyril Ramaphosa was supposed to deliver the opening address but had to attend to an “international” matter. He was replaced with Magashule. Ramaphosa is expected to make the closing remarks on Saturday. Earlier in his address, while still reading from his prepared speech, Magashule said that the hallmark of any revolutionary movement was the ability to look critically at itself. “We must never lose sight that the revolutionary movement becomes invisible if it is allergic to criticism and introspection,” he said. The ANC worked as a collective but the party now faced “an offensive onslaught” from inside and outside its ranks that sought to destroy any revolutionary gains that had been achieved, he said. This is the ANC’s second attempt at a re-run of its 2015 provincial conference, which was declared invalid by the Pietermaritzburg High Court late last year. That court decision led to the provincial leadership being suspended by the party’s national executive committee and an interim leadership structure being installed to resolve factional disputes and pave the way for a rerun of the conference.